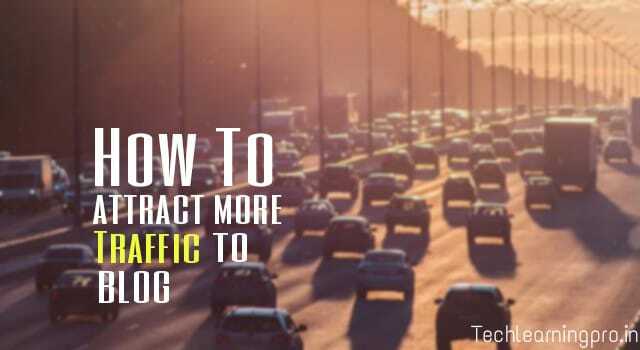 How to attract more traffic to your blog? HomeBlogging and SEOHow to attract more traffic to your blog? Here in this post, you will learn how to attract more traffic to your blog and be a successful blogger. So keep supporting and read this post carefully because after this you will be able to attract organic visitors to your blog and boost your earnings. In this post, I will present some ultimate tips by which you will see amazing growth in your blog traffic and its Alexa rankings. The volume of traffic on your blog depends on your keywords. Try to use high CPC keywords to get a high amount of traffic on your blog from Google. This means you have to find the keyword with high volume, low competition, and high CPC. Low competition means your post will be ranked in a very short period of time and will be visible to the visitors. High volume keywords will provide you, massive organic visitors. But now the question arises is that how to get the best keywords for your posts? Google keyword planner is a platform specially designed to get information about keywords. Google keyword planner provides the best information about the keywords to its users. It is totally free of cost and its data is accurate. In order to use Google keyword planner simply you have to create a free account on Google keyword planner and after that, you will be able to get data about the keywords such as traffic volume, competition, and it's CPC value. So if you want to find best keywords for your post to attract a lot of visitors you must use Google keyword planner, and I am quite sure after its use you will see incredible growth in your blog traffic. Soon I will write an article regarding Google keyword planner and in that article, I will show the full process to use Google keyword planner. So here is another platform to find information about keywords and get the best keywords for your posts. Keywords everywhere is a Chrome extension which is the same as Google keyword planner. whenever a user searches something on Google it shows it's competition, the volume of traffic, and the CPC of that keyword. So I am quite sure it will also help you to get high CPC keywords. To use this extension just visit Google Chrome web store and search for keywords anywhere, after that add that extension to your Google Chrome and all done now just search anything and the process will be started. Now the next is Social Network. Social media is the best-considered platform to promote your website or blog. As we all know Facebook is a community of peoples, so Facebook can be easily used to generate traffic to your blog for that you can join groups and share the link of your posts in that group to attract the visitors. On the other hand, you can create a Facebook page regarding your blog website and start posting there this will also help in boosting your traffic. Twitter and Pinterest awesome other social networks which can easily be used to generate traffic to your blog. Suggest you have to understand the power of Social Network and use it as a weapon to get more and more traffic and visitors to your blog. Backlinks are the links that promote your website in the algorithm of Google. If you have a number of backlinks available for your website or blog then you will see massive growth in traffic and the improvement of Alexa ranking of your blog. Soon I will provide a separate article in which we will discuss backlinks, and how to create backlinks to generate traffic and a lot more information about backlinks, so this is my humble request this please regularly visit my blog to get interesting articles. The next one is On page SEO which will optimize your post in such a way that your post will be indexed in a very short period time and Soul rent in Google. On page SEO act as a weapon which will surely help you to generate a massive and a huge amount of traffic and Boost Your earnings. I have written a separate postpone on page SEO so I am providing you the link of the post. If you want to get information about on page SEO you must visit this link. Read - What is On-page SEO?